The idea about the expedition to Mauritania started shortly after we returned from Comoros islands. When we looked for location for year 2017, we decided that we have to choose spotcloser to Europe and North America, as resultof propagation and a low solar activity. It was clear, that the choice will be somewhere in the upper half of Africa continent. Where to? Most countries we can divide into two categories - dangerous (health risks, political or safety reasons) and others which are relatively safe, but from a view of radio amateurs not so interesting. DX community desires activation of “rare” countries. After long and passionate discussions compromisesolution was selected- Mauritania. Directions to EU and NA areexcellent, distance is acceptable. In this country has been two active amateurs - Jean 5T0JL (ON8RA, active CW) and Ahmad 5T2AI (9K2AI, active SSB). We contacted Jean and explained our intention. He promised to arrange permission to operation.He kept his promise. 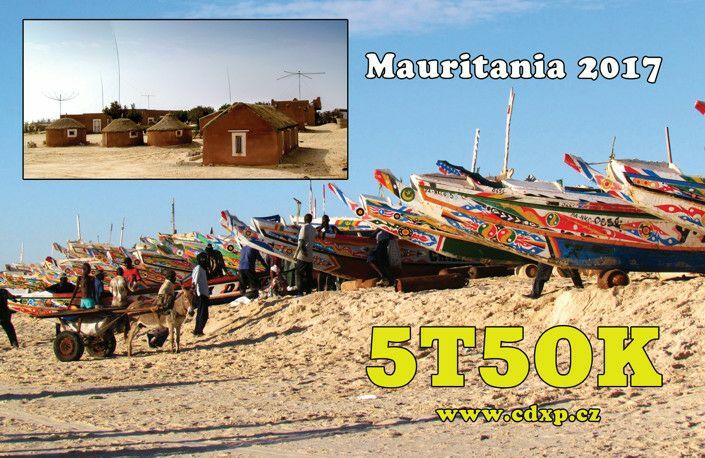 After intensiveemails exchange and visitto the ARE (local telecommunication office) we have been granted permission to operate from Mauritaniaundercallsign 5T5OK. Ahmad was acquainted with our plan so nothing hindered to choose suitable QTH. We wanted to be the closest to the sea, ideally directly on the coast and concurrently near the airport. After searching, we decided for Sabbah hotel - same hotel in which were successful expedition of Polish operators 5T0SP in 2012. Hotel is on the edge of Nouakchott (capital of Mauritania). Unfortunately, it hasn't got own website, phone number and emails don't work more or less and the owner doesn't speak English. We were reliance for personal visits of Jean and his mediated information. Jean knew this hotel (he was member of 5T0SP), he checked the currentstatus, he found of price range and everything seemed to be on the right way. Expedition team got certain changes - Pavel OK1FPS apologized because of work reasons, but we could welcome two new members - experienced operators - Karel OK2ZI and Palo OK1CRM. Jean and Ahmad wanted to be a member too, so we were together nine. Each of us had to something to prepare. We bought air tickets on 31st May (from Munich because of price - the difference was 300€ on each ticket from Prague) and in the middle of August was pre-expedition meeting in Řitka at Petr’s OK1FCJ house, where we packed the first luggage. So we were looking for and we found a contact on Terjit Vacances - restaurant with accommodation right next to Sabbah hotel, even with better options for antennas, but mainly - English-speaking owner, who responded in a few hours - that’s incredibly for Africa. So after a many discussion and exchange e-mails we made a deal, that our QTH will be Terjit. Ahmad 5T2AI visited this hotel, checked and he decided that it’s suitable for the expedition of our type. The preparations culminated and we got third bad new two weeks before departure - Ruda OK2ZA has broken his both legs and his participation was impossible.. We had to reduce our luggage again and from seven planned operators we were just five. We had to buy one big luggage, because we could have just 2x23kg + 12kg - cabin luggage, but we didn’t get to this limit. On Thursday - 14th September - the date of our departure - the expedition started! We were meeting at David’s OK6DJ house in the evening, where we were packing remaining luggage and after delicious dinner (of course with Pavel OK1MY) we went out with a wagon to Munich Airport. Air travel was - compared with D6 - easy. 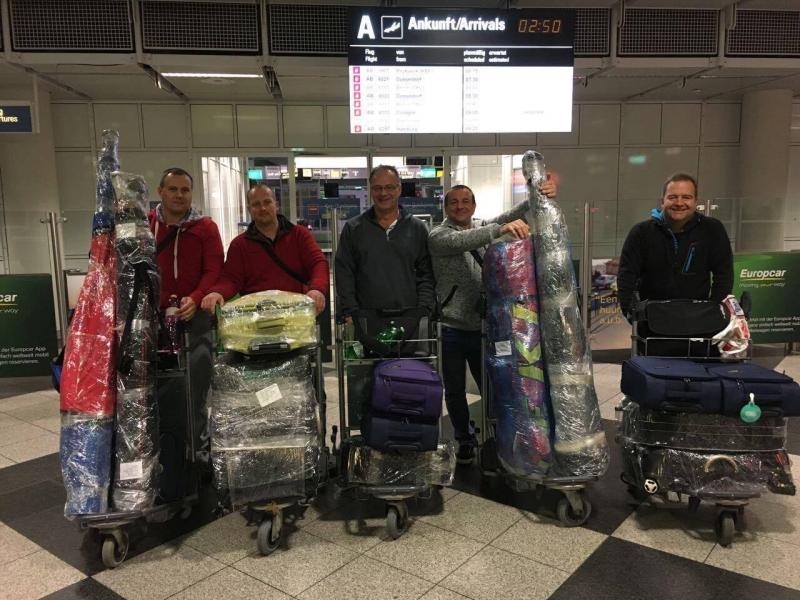 On Friday morning we successfully passed check-in and group, which is composed of OK1BOA, OK1CRM, OK1GK, OK2ZI and OK6DJ, boarded to the plane of Air France at 7:10 AM and flew away from Munich to Paris. There was a break for 2 hours and then was a flight directly to the Nouakchott. We landed at 2:15 PM (local time), Ahmad waited for us in the arrivals hall, he helped us with customs transit and with visas and he gave us SIM cards of the local operator. From our luggage just one didn’t land, it’s important to write complaint before leaving the airport. Then we left with Ahmad to our QTH. The journey took about 30 minutes and we asked him about local relations and customs. TerjitVacances is beach restaurant - bar, which offers accommodations in one room and ties bungalows, but besides it has conference hall too. Hall is spacious (130 square meters) and above-standard - with desks, chairs, air-condition, electricity, Wifi - that was what we needed and after arriving we detected that reality agrees with information, which was required before or we searched them on the internet. A lease of the hall isn’t cheap, we told about rent a few weeks ago and after many e-mails, we made a deal - 150$ for a day. Hall was our hamshack, where most of us slept too. Bungalows, which we rent, are designed in traditional style - from clay with a straw roof and with one small window, without equipment, just with three mattresses on the floor. From the side of European, it’s nightmare, but that’s good for African. Saturday 16th September. We divided into groups after breakfast. The owner allowed us to placed one beam on the roof of the restaurant so OK1BOA built right on the roof Spiderbeam. OK1GK built in a fence a vertical (80 metres) with a pair of tuned radials, OK2ZI made 5 el. for 6 meters and OK6DJ with OK1CRM built Hexbeam and we pulled coaxial cables in pauses. After installation was showed that Hexbeam and Spiderbeam were disturbing each other and we had to separate them bythe bigger distance. We couldn't move with Spiderbeam so we had to find another place for Hexbeam. The work has lasted the whole day. We talked to the owner that we had eaten in his restaurant, so we didn't have to take care of food. They cared about us very good. OK1GK prepared a part of 4SQ on 40 meters that we could be on 3 bands the first night. Temporarily, just one 4SQ radiator was connected as a vertical. At dusk, we lifted tentative vertical on 30m in close proximity to hamshack. Receiving was very hard due to strong interference was discovered on thisband. We found out after two or three days that the cause is one of the LED panels in the hamshack, which we always switched on. The first QSO was symbolically with Ruda OK2ZA, who had to stay at home. We have activated other bands - 12m, 20m, 30m, 40m and 80m till evening. Sunday 17th September. We were still without lost luggage, so we couldn't build antennas for 160 meters. We tried hard to transmit, gradually we were on all modes including FT8, which experienced BOOM. During the day we did “fun” and we transformed 30m vertical behind Hexbeam. We expected that interference of Hexbeam and Spiderbeam will be smaller and reception on 30m will be better. We build another antenna - vertical on 60m, PSV 1:1,4, antenna tuned a little bit above the band, we didn't modified it anymore. David sat down to the radio and after many CQ he made the first QSO on this band with OK7GU. Monday 18th September. We decided that we have less antennasfor the upper bands though on the Spiderbeam was connected triplexer from VA6AM, which from one antenna does three. So OK1GK made tentative VDA on 17m. We built the antenna on the terrace in front of the hamshack because of having the shortest feedline. According to the reports, the antenna worked well so after two falls in strong wind we fixed it. They brought Karl’s lost luggage in the evening so we started to build the antenna on 160m immediately –the base of vertical is Spiderbeamfiberglass (18 metres) with capacitive hat from four wires, and with four radials. We finished at night, it dazzled here faster than we were used to be, we had a headlamp, but local resident lit us with LED lamps. The antenna was tuned above the band but in the band it had 1:1,5 so we decided that we let it till tomorrow and Karel immediately started pileup. After a few CQ, the first station in the log - OK1BN. Dinner was followed and then we set down to the radios, we found out the antenna - 60m didn't work. A cooling wagon arrived in the afternoon and damaged the coax cable. The problem was solved in few minutes. The temperature at nights didn't fall below 30 degrees so we were grateful for air-conditioning in the hamshack, where was 25 degrees. We worked at the same time 160CW + 80CW + 60CW + 30RTTY and 20SSB till midnight. Unfortunately. On 30m was so strong interference that we logged only strong stations and we switched it off with apologizes after hour. We returned later, when the interference was away. Tuesday 19th September. 30m band was without interference in the morning so we continued on RTTY, later we tried on 17m too, where were strong pileups. All stations were almost strong, split-window 1-5 up didn't suffice. Operation was very difficult and lengthy, rate dropped under 60QSO/hour. Karel OK2ZI made 119 contacts on 160m during first night, the vertical worked good, but it would want receiving antennas. Control form ARE arrived in the afternoon. They checked all operators due passports, all radios and their serial numbers, accessories and all antennas too - if they are like in the inventory, which we sent them a long time before expedition. We took picture together before leaving and then we pulled one beverage to Europe way and we hoped that it will evince. Wednesday 20th September. Karel OK2ZI spent the whole night on 160m, listening on beverage was a benefit and we planned to stretch another. Except this, we wanted to transmitand change the coaxes. The low-power cable Messi led to all yagis, but the other antennas had RG58 so we changed the cable for RF240, which has better coax loss. We changed feeders to 160m, 80m and 40m antennas, all were about 100m long so attenuation was here too. We added radials under the 160m vertical in the afternoon and Karel OK2ZI with David OK6DJ were pulling other beverages. The benefit was to know, vertical has better PSV and reception on RX antennas was cleaner. We have been QRV the whole night without interruption on 160m, 80m, 40m and 30m. 16 thousand QSO was in the log at midnight. The antennas worked well and we read just positive feedbacks on the internet, which make us happy. Thursday 21st September. After the exhausting marathon all operators went to the bed early morning. We built another antenna - VDA for 15m. It was located 100m away from the antennas, but we could be inband 15m CW and SSBsimultaneously. In combination with Hexbeam it didn't work, it interfered each other, but it was better in combination with Spiderbeam. Ahmad came in the evening, he replaced Petr OK1BOA on his station and he did a few tens QSO on 40m SSB. Friday 22nd September. We woke up several times a night. The strong wind did roof wounds. The wind leaned vertical on 30m and destroyed vertical on 160m, which we couldn't repair in this wind. We had to ensure all upper band antennas, it turned around spontaneously in the wind. The wind turned its direction and a hot dry wind from Sahara blown to us. Sensibly, the temperature was higher than it was. It has opened the band 6m this day and we did a few tens QSO. Saturday 23rd September. CQ WW RTTY Contest was started. We decided for category M/2 Low power, but we found later that this category doesn't exist and even if - we had only 100W, we were included among all other M/2 stations. What could we do... After midnight we started. OK6DJ was on 40m and OK1GK on 80m. There was operation very difficult, the first night is always “battle” between strong stations and we had problems to cake to EU and NA with low power. After two hours we gave up 80m, OK1GK went to the bed for a few hours and he woke up on 20m, where was operation better. We worked split up 1 and because of Low Power we tried to be somewhere away - high in the middle of stations. The used N1MM contest log. We tried to change MMTTY and MMVARI in the afternoon, but it was unsuccessful and N1MM was blocked so we had to separate one station from net and logged to Wintest. After race was work - unite both logs together. Rest of team occupied the WARC bands, immediately we realized that we didn't need ears on RTTY and we tried to be on others stationson SSB. Later, we repaired the vertical for 160m. Sunday 24th September. We run on four stationsdigimodes, FT8 on 160m and 30m and at the same time RTTY on 40m and 20m. The second night of the contest was better than first, it was to know that strong stations had LP too and we had a chance. Karel OK2ZI was awake the whole night on 160m so a many new stations wereinthe log, among them two KH6. He slept in the morning and he controlled a beverage on EU in the afternoon, which was broken again. Local resident people walked around the hotel to the see and dogs and goats freely wandered, so Karel told that we had to do a check and fix the beverage. Petr OK1BOA mastered SSB operation and he made most of SSB QSOs. Palo OK1CRM alternated SSB and CW. He did it great too. Monday 25th September. We went to bed after finishing RTTY contest, but just for a few hours, because path to JA was open every morning after sunrise via LP on 30m and 40m. We were every dayon both bands, we didn't omit not even one morning that we gave the biggest space for JA stations, which are really far from 5T. Between JA we logged many VK and ZL stations. On 40 was work easier, 4SQ worked very good and gain from one direction was appreciable. The situation was worse on 30m, vertical with100W was paucity, we had to repeat a report to each stationmany times and we knew that we were too weak. We were patient and we tried to use morning windows and reducethe CW speed to the current conditions. We were changing upper bands during the day. Conditions were great today, we have been on upper bandsuntil night and we have logged more than 5k QSO this day. We found in the evening that vertical on 60m was damaged again. We had to repair it, but we didn't have a time so we haven't been active on 60m this night. Tuesday 26th September. We were on 40m and 30m again, after closing window, we repaired vertical on 60m that we could be QRV next night. 17m was the best in the morning so we were on this band every day to have the largest number of band point. 17m was our best band. We were on the trip on the afternoon. We were in Nouakchott; the owner of the restaurant Elhadj invited us to sightseeing tour in this city. We visited the local museum, interesting places and few souvenir shops. Car transport fascinated us, nobody respects traffic signs and lights. It was to know, because half of the cars were damaged. Then we were invited to Elhadj’s house, where we ate the traditional meal - chicken with onion and rice. Elhadj attentive, he spoke very well English so we could talk with him about everything. Then we came back to Terjit, we set down to the radios and we transmit till evening when was ready for us a celebration dinner to reach 30k contacts. Wednesday 27th September. Morning conditions were different –the USA was very good on 40m, but LP opening on JA wasn't. Many blackouts because of power outage disturbed our calling, but it was just for a few minutes. They had standby diesel-generator on Terjit. We did a minor repair of 60m vertical. Conditions were very good on upper bands, 6m was opened to EU and we did a few CW QSO, unfortunately, the signal didn't go to OK. OK1BOA and OK2ZI went with Ahmad to Jean’s 5T0JL (SK) house. They dismantled his Spiderbeam. Karel did first two Japanese stations in Japanese window on 160m. Use of Japanese window was problematic, at the same time the propagation to the Europe was good and stations didn't listen our directional CQ for JA/ASIA and they called us. Opening to JA was short - about 15-30 seconds and we had to do complete QSO. We could do it only with CW. Thursday 28th September. It was las day of full operation. We used to open upper bands but thought about packing and nervousness with leaving and problems in airport. Karel did on 160m new JA and DU station and he heard next two JA. We packed first three antennas for upper bands, we didn't need them anymore. Low-band antennas stayed overnight. Ahmad arrived with his friend in the evening. They brought grilled local food and stayed with us till night. We took pictures and we discussed about everything. Ahmad told us that he hadn't been on the airport with us, but he sent someone, who will help us. We went to bed and we were thinking about next day. It was 42 degrees during the day. At 4 PM everything was packed, we went to sea, took pictures with personal, gave presents and said goodbye to Elhadj. We went to the airport in the evening. No problems with check-in. After the fast transfer in Paris we landed at 8:30 AM in Munich. We found that five pieces of luggage of 11 didn't land, we couldn't wait, and we wrote reclamation and set to the car. We were tired, everybody slept in the car. We woke up beyond the borders of OK. Our driver Jirka OK1OL went to DolníKamenice to the QTH of David OK6DJ, where his XYL cooked delicious pork steak with potato salad (TNX!). We said goodbye to each other and we then everybody went home. Next great radio amateur adventure was finished.